Homemade Spaghetti Sauce - A recipe from Savor California, the online showcase for extraordinary gourmet foods and beverages from California. This is a delicious, aromatic recipe that fills the house with the aroma of spice. It's equally good as a meatless marinara. In a large sauce pan brown the ground beef in the olive oil over medium heat. Add chopped purple onions and minced garlic, and sauté until they are almost caramelized. Then add the sliced mushrooms and sauté for a couple of minutes, before adding the pureed Italian tomatoes and the Engage Organics spices. The longer this simmers, the better the tastes combine. Add wine and simmer for another hour. 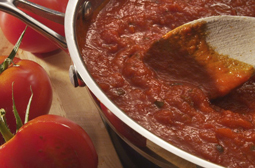 The Italian tomatoes make a huge difference in the taste and quality of your sauce. Sauce freezes very well for later use.